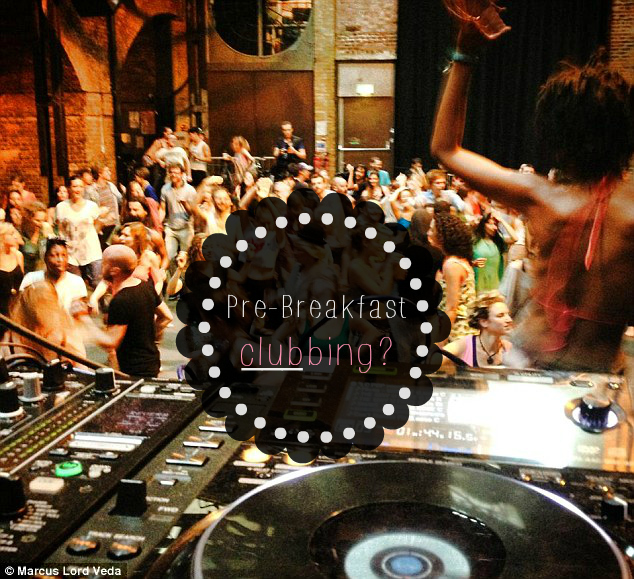 Pre-breakfast clubs // worth raving over? If you're a party girl who can't stand the thought of the gym, or if you're just sick of being a slave to the treadmill, maybe it's time to rethink the way you exercise. The organisers of the revolutionary *Morning Glory Early Morning Club have created the perfect opportunity for participants to experience the adrenaline and joy of dancing in a club environment, withouth any unpleasant after-effects that a normal night out would bring to it. Anyone attending Morning Glory can expect healthy smoothies and a free massafe to accompany their dance workout - a welcome change from overpriced cocktails and unwanted contact on a cramped dance floor. The concept of the pre-breakfast club is simple: arrive at the venue before work, dance to music mixed by professional DJs for an hour or so and (as the tagline reads) 'rave your way into the day!'. Not only will you start your day energised and raring to go, but kicking off the morning with a leisurely rave sounds much more inviting than dragging yourself to the gym. If you make excuses not to go to the gym, then find a more enjoyable form of exercise that excites you - the positive results will be a pleasant surprise. Imagine being able to go clubbing without the obligatory hours of hair, make-up and outfit choosing beforehand. While some attendees (in true raver style) like to wear neon colours and even sport face paint and wigs to the early morning club events, any comfortable outfit will do. Reuse your old gym clothes (let's face it, you won't be going back there after this) or invest in some cheerful new exercise wear to make you feel the part. There are plenty of suitable and affordable tops and leggings for women at Very that will allow you to dance the early morning away in comfort and style. The morning Glory website even encourages participants to turn up in their pyjamas if they wish, meaning that for once you will be rolling out of bed and onto the dance floor, instead of the other way around. WOULD YOU BE INTERESTED IN THIS TYPE OF EXERCISE? SHARE YOUR THOUGHTS AND LET ME KNOW IN THE COMMENTS BELOW!